The project is the largest private Arkansas River Development in Tulsa’s history. 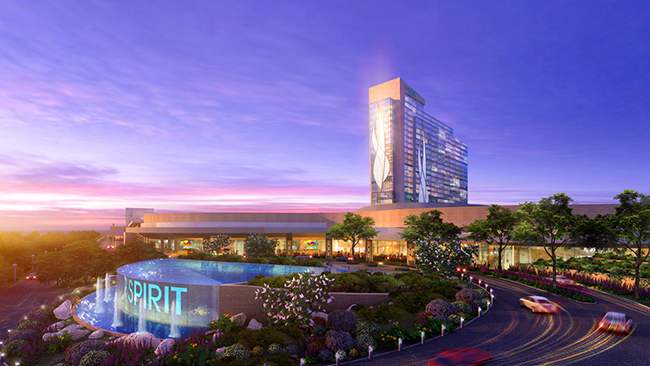 TULSA, OKLA. – Muscogee (Creek) Nation gaming officials have selected Manhattan Redstone, a joint venture partnership between Manhattan Construction Co. and RedStone Construction Co. to build the River Spirit Casino Phase II Development Project. Both firms are based in Tulsa. The expansion project will feature a Jimmy Buffett’s Margaritaville Casino and Restaurant, a 22-story 500-room upscale hotel tower, a world-class spa, convention and meeting center along with other new restaurants. According to the announcement by River Spirit Casino this project will be the largest private Arkansas River Development in Tulsa’s history. The cost of construction is expected to be $250 million and will create an estimated 1,800 local construction-related jobs throughout the course of the 18-24 month project. The two-year construction project will support an income of $161.9 million and a total of $226.5 million in the production of goods and services throughout the Tulsa region. In addition, the construction activity will support the collection of $2.1 million in local sales tax and $2.5 million in property tax. “We at River Spirit and the Muscogee (Creek) Nation are committed to providing quality jobs, and economic stability for Tulsa-area residents,” Muscogee (Creek) Nation Casinos CEO Pat Crofts said. The partnership with Jimmy Buffett’s Margaritaville will offer patrons a laid back atmosphere inspired by the lyrics and lifestyle of Jimmy Buffett, featuring casual dining, a bar and live entertainment along with a retail store. Dallas-based architecture firm HKS is coordinating the project’s design. 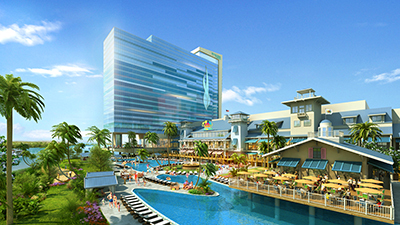 HKS is working with Margaritaville’s architect McBride Companies in the overall design. Tulsa-based Program Management Group Native will serve as the owner’s representative. Founded in 1896, Manhattan Construction is recognized nationally by Engineering News-Record as a top 20 general builder. Manhattan Construction operates from offices in Tulsa and Oklahoma City, Okla.; Dallas and Houston, Texas; Naples, Fort Myers, Sarasota, Tampa, Kissimmee, Fla.; Washington, D.C.; and Atlanta, Ga. Manhattan Construction’s building portfolio includes corporate headquarters, institutional, healthcare, office, hospitality and leisure, sports and entertainment, aviation, retail, and judicial facilities throughout the United States, Mexico, Central America and the Caribbean. For more information visit: www.manhattanconstruction.com or connect with us @ManhattanBuild, via Facebook/ManhattanConstruction and on LinkedIn. College Station – Texas A&M University received approval from the A&M System Board of Regents to proceed with one of the largest college football stadium redevelopments in history, with a project cost of $450 million and a future stadium capacity of 102,500. Manhattan | Vaughn, a joint venture partnership between Manhattan Construction Co. and Vaughn Construction Co, is providing construction management services for the project. Manhattan is ranked as the number one Sports/Recreation Builder by Engineering News-Record (ENR) Texas & Louisiana. Manhattan has constructed some of the nation’s most recognized sports structures including Cowboys Stadium in Arlington, Texas and Reliant Stadium in Houston, Texas. Vaughn Construction has built 45 projects on eight campuses for Texas A&M University System. Populous is providing architectural design services for the project. The renovation and expansion of Kyle Field will start immediately following the 2013 football season and is scheduled to be completed in time for the 2015 season. The Aggies will continue to play at the historic stadium, which dates back to the 1927 season and has a current capacity of 82,589, during the entire construction process. 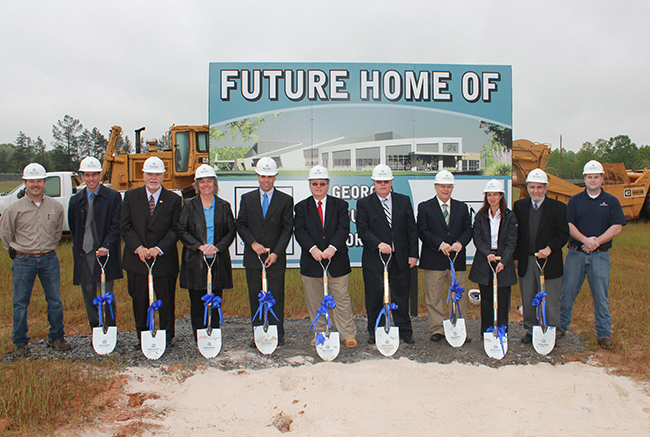 Manhattan Construction Co. Begins Construction on Georgia Poultry Laboratory Network’s New Headquarters in Hall County, Ga.
ATLANTA – Representatives of Manhattan Construction Co. joined state and local officials, including Georgia Gov. Nathan Deal and Georgia Agriculture Commissioner Gary Black, Monday for the groundbreaking of the Georgia Poultry Laboratory Network’s (GPLN) new headquarters in Hall County’s new Gateway Industrial Centre. Manhattan Construction will build the $13.7 million, 39,000-square-foot facility. Completion of the single-story building, which will feature laboratories with biosafety levels (BSLs) of 2 and 3 as well as general office space, is scheduled for late summer 2014. GPLN provides diagnostic and monitoring services to Georgia’s commercial poultry industry to ensure the safety and health of poultry flocks, eggs and other poultry products. Its headquarters are currently located in Oakwood, Ga.
More than 100,000 residents of Georgia are either directly or indirectly employed by the poultry industry. Manhattan Construction has constructed some of the nation’s most advanced science and technology facilities. The company is currently building the U.S. Army Research Institute of Infectious Diseases (USAMRIID) replacement facility in Fort Detrick, Md. When complete, it will contain the largest block of BSL 3 and 4 laboratory suites in the world. Founded in 1896, Manhattan Construction is consistently recognized nationally by Engineering News-Record as a top 20 general builder. Manhattan Construction operates from offices in Tulsa and Oklahoma City, Okla.; Dallas and Houston, Texas; Naples, Fort Myers, Sarasota, Tampa, Kissimmee, Fla.; Washington, D.C.; and Atlanta, Ga. Manhattan Construction’s building portfolio includes corporate headquarters, institutional, healthcare, office, hospitality and leisure, sports and entertainment, aviation, retail, and judicial facilities throughout the United States, Mexico, Central America and the Caribbean. For more information visit: www.manhattanconstruction.com or connect with us @ManhattanBuild, via Facebook/ManhattanConstruction and on LinkedIn. 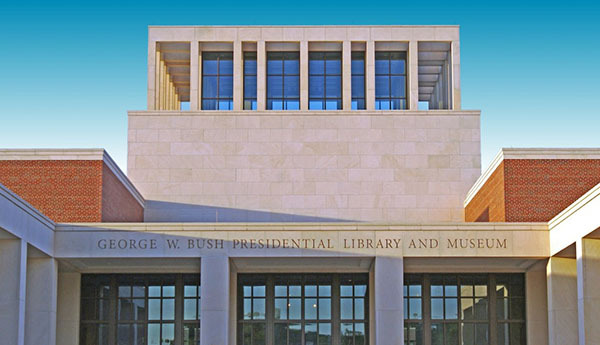 Dallas – Manhattan Construction takes its place in history as the only construction company to build two presidential libraries with the May 1, 2013 opening of the George W. Bush Presidential Center on the campus of Southern Methodist University (SMU) in Dallas. Manhattan Construction also built the George Bush Presidential Library and Museum in College Station, Texas. The George W. Bush Presidential Center, a brick and limestone building, was built on a 23-acre lot on the campus of SMU. The Bush Center holds the George W. Bush Library and Museum, and the George W. Bush Institute. The Institute section of the building houses offices, a 360-seat auditorium, seminar rooms, a fully-equipped broadcast and recording studio, and reception rooms. A ceremonial courtyard with a café, a full-service restaurant, and museum store are also located within the George W. Bush Presidential Center. The Library and Museum, administered by the National Archives and Records Administration, is the permanent home of more than 43,000 artifacts from the Bush Administration. It is the thirteenth Presidential Library and includes a 14,000-square-foot permanent exhibit, as well as temporary exhibit space and research room for scholars and classrooms for school groups. The Museum includes re-creations of the Oval Office, the Rose Garden at the White House, and the Situation Room. Freedom Hall, a 67-foot high tower, lit at night and featuring a unique, 360-degree, high-definition video wall as part of the Museum, is the signature architectural feature of the George W. Bush Presidential Center. The 226,565-square-foot building achieved LEED® Platinum certification from the U.S. Green Building Council, the highest level of certification in the program. 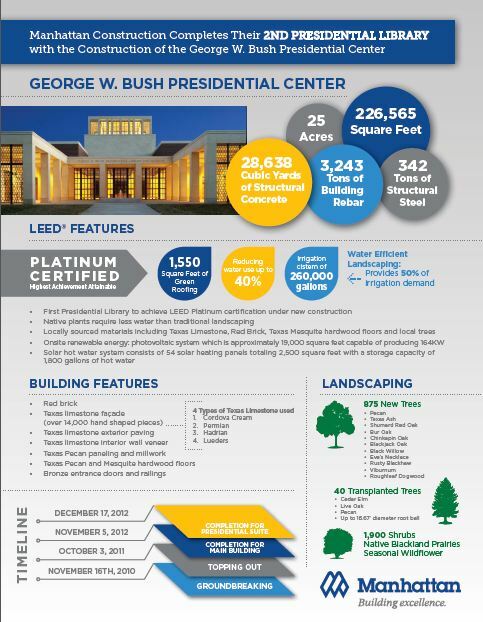 It is the first Presidential Library to achieve LEED certification for new construction. A number of sustainable design features are incorporated into the design, including 54 solar heating panels which are designed to supply 100 percent of the building’s domestic hot water. The building team also installed approximately 900 trees in the project’s landscape. “The Bush Center and our ongoing work are a reflection of the principles that guided President and Mrs. Bush in their public service, including their longstanding commitment to conservation and caring for the land,” said Mark Langdale, President of the George W. Bush Foundation. At the peak of construction there were more than 650 workers on site at one time. More than 60 subcontractors served on the project and nearly 1.6 million work-hours were logged during construction. The project began with the November 16, 2010 groundbreaking and was completed in just 22 months. The building was designed by Robert A.M. Stern Architects and complements the American Georgian character of the SMU campus. It is surrounded by a 15-acre urban park, which features native Texas landscaping and a rainwater collection system that will provide 50 percent of the irrigation needed, created by Michael Van Valkenburgh Associates. A time-lapse video by EarthCam of the project’s construction can be viewed at this link: http://www.manhattanconstructiongroup.com/manhattan-construction-group/2013/04/23/watch-time-lapse-construction-video-of-the-george-w-bush-presidential-center. Founded in 1896, Manhattan Construction is consistently recognized nationally by Engineering-News-Record as a top 20 general builder. Manhattan Construction operates from offices in Tulsa and Oklahoma City, Okla.; Dallas and Houston, Texas; Naples, Fort Myers, Sarasota, Tampa, Kissimmee, Fla.; Washington, D.C.; and Atlanta, Ga. Manhattan Construction’s building portfolio includes corporate headquarters, institutional, healthcare, office, hospitality and leisure, sports and entertainment, aviation, retail, and judicial facilities throughout the United States, Mexico, Central America and the Caribbean. For more information visit: www.manhattanconstruction.com or connect with us @ManhattanBuild, via Facebook/ManhattanConstruction and on LinkedIn. The George W. Bush Presidential Center is home to the Bush Presidential Library and Museum and the Bush Institute. The Bush Center’s 226,000-square-foot building and 15-acre urban park reside on the campus of Southern Methodist University in Dallas, Texas. President and Mrs. Bush founded the Bush Center to continue their work expanding freedom at home and around the globe. 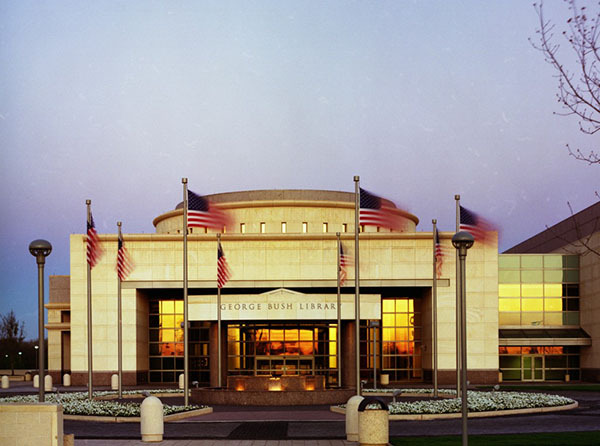 The Bush Presidential Library and Museum opens to the public on May 1, 2013. For more information, visit www.bushcenter.org. You are currently browsing the Manhattan Construction Group blog archives for May, 2013.